3Gen Flats: What are They? 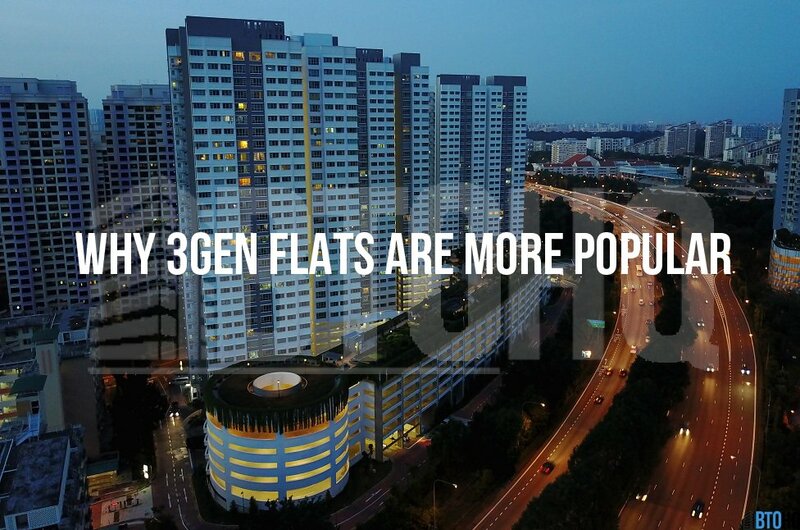 Between 2012 and 2015, the average take up rate for 3Gen flats was 83 percent. That’s a lot – considering that the initial expectation was 50 percent. If you’re new to this, 3Gen flats are basically multi-generational flats. Think you, your spouse, and your parent(s) staying under the same roof. Of course, the bigger size compensates for the additional occupancy. It’s not much at 115 square metres, 5 sqm more than the usual, but every bit counts. They aren’t that expensive either, ranging between $300k to $600k, depending on location. There is but one key restriction placed on 3Gen flats: they can only be sold to other multi-generational families. Additionally, if you own a flat that’s 3-room or more, you cannot rent it out, until 5 years later when the MOP passes. With these restrictions, you might think that the demand would be low. You’re not the only one – in fact, the former minister Khaw Boon Wan had similar initial thoughts. However, the overwhelming response of these flats is clear as day, proof of their immense popularity. In this article, we explore 4 of the possible reasons why they are more popular. The wait for a BTO to be built can be pretty long at 3 to 5 years, but the wait to ballot for a good queue number can be even longer. I personally think that it really depends on your luck and the demand – some people under the Married Child Priority Scheme (MCPS) may not ballot successfully even after a few attempts either. Add in that fact that popular mature estates are often oversubscribed, it makes balloting seem bleak. If you’re opting for 3Gen flats, and the MCPS, you get 6 chances, as compared to 2 for regular balloters. The benefits of staying with your parents are many. As retirees, they can take care of your child when you and your spouse are at work. You don’t have to spend hefty amounts for childcare, and they can even cook and clean. You can look forward to lovingly-made home-cooked meals, and eliminate the need to hire a helper. Household bills can also be split among yourselves to make the costs even easier to bear. For 3Gen flat applicants, they are eligible for the Proximity Housing Grant (PHG), apart from the Married Child Priority Scheme (MCPS). This grant provides greater financial assistance and flexibility for home buyers. It offers an additional $20,000 grant for families and $10,000 for singles. By staying with your parents, you can take care of them easily. It gives you peace of mind knowing that you’re there where they are. This is especially so if your elderly parents are not in the best of health, or are suffering from chronic illnesses. Aging parents need more in-depth support, and staying with them would therefore be a good chance to. Running to and fro from their own house to their parents’ would also be unpractical if the parents stay far away. It would also make no economical sense. Therefore, this would be one of the reasons for purchasing a 3Gen flat.